Are you promoting an event, business, or political campaign? A bandit sign, also called a coroplast sign or yard sign, is an excellent way to educate potential clients or customers about your services or products, support your favorite political candidate, or advertise your next special event, without spending a large portion of your budget. Call Black Parrot Sign Studio today at (714) 406-0939 for your Free Consultation with a Yard Sign Specialist! Yard signs are an effective business marketing tool, regardless of the type of business, you operate. We’ll craft a unique, innovative, eye-catching yard sign that will increase your business’ visibility and establish your brand. These signs work well for non-profit, service providers, and retail stores. Black Parrot Sign Studio is a complete sign shop. We’ll handle all aspects of the sign creation process. We can make a custom design or use your ready-to-print files. Depending on the number of signs you need, we can offer same day or next-day production. We have the skills, knowledge, and tools to offer professional quality single color prints or full-color yard signs. We will complete your project quickly, correctly, and within your budget. 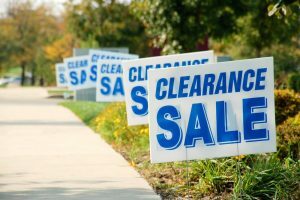 While yard signs are used by various types of businesses, real estate agents are known to be the largest users of these types of signs. 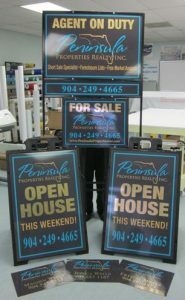 A real estate agent might use a yard sign for open houses, or to advertise a home or business for sale. These yard signs are often customized to promote the agent’s brand and provide potential buyers with additional information, such as brochures and flyers. We’re not limited in how we can customize your sign. 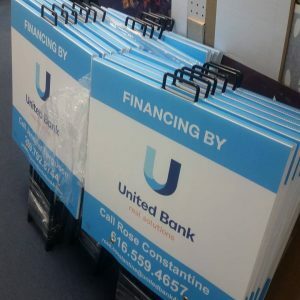 We can create attractive customized real estate sign holders. In addition, we can make other types of signage including outdoor banners, lobby signage, and storefront signs. Black Parrot Sign Studio wants to be the sole provider for all of your signage needs. The use of yard signs is not limited to real estate and businesses. These signs are popular during the election season because they’re portable and inexpensive. A candidate can use a yard sign because this is convenient and easy-to-use sign can help them to boost visibility amongst their constituents. A candidate may give these signs away to their supporters during rallies. They may also be handed out by supporters to local residents or the candidate may deliver them to voters homes as they canvas the local neighborhood. Some political hopefuls even allow a person to order these signs on a campaign website. A yard sign will increase a campaign’s visibility amongst local potential voters. Local residents see the campaign’s yard signs as they go about their daily lives, which can increase name recognition. This type of visibility can increase a candidate’s chances of winning a person’s vote. You don’t have to place an order online, hope the details will be correct or wait for days to get a yard sign. Our shop offers local pick-up and fast service. We will even create a sample yard sign for you, so you can ensure you get what you want.